53 total news articles in this section, 10 per page. Cybertron.CA is reporting that the highly anticipated Transformers Prime "First Edition" Voyagers are starting to turn up at Canadian Toys"R"Us stores. 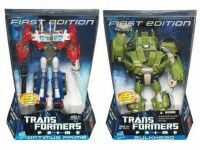 The Voyager wave includes Optimus Prime and Bulkhead. Hopefully these, the Entertainment packs, and Deluxe wave 1.5 featuring Cliffjumper will be making their way to US retail soon. 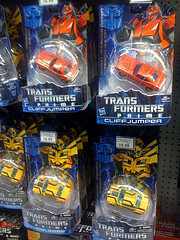 Cybertron.CA is reporting that the highly anticipated Transformers Prime Cliffjumper from the Deluxe "First Edition" case revision has started to turn up at Toys"R"Us. Hopefully his US release is close at hand. Good news for all you Cyberverse fans out there! 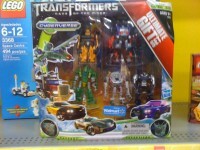 The Wal-Mart exclusive Ultimate Giftset has been spotted at retail. The $29.96 set features repaints of the Cyberverse Commanders Optimus Prime and Powerglide, along with repaints Legion Class Bumblebee, Crowbar, and Sideswipe. Image courtesy of Mangamike, who found the set in Clinton, Tennessee ( near Knoxville). Good news Power Core Combiner fans, the elusive wave five Over-Run with Stunticons 5-pack is starting to show up at discount retailers. Our own It Is Him found and purchased the set at a Ross in Jacksonville, FL for $10.99. 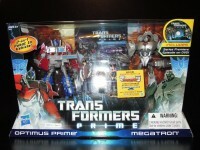 This is news many of you have been patiently awaiting, the highly anticipated Transformers Prime "First Edition" Figures have been sighted at US retail. The Deluxe wave featuring Bumblebee, Arcee, and Starscream has started to show up in Texas. TFW2005's woolypanda found the figures at a Fort Worth Toys"R"Us, and TFormers' puma found them at an Irving Toys"R"Us. Let the hunt begin! Thumbnail image courtesy of TFormers' puma. Good news Classics universe fans! This year's final wave of Generations figures featuring Sky Shadow and Junkheap have been spotted at retail. TFW2005's Gen. Magnus purchased the highly anticipated figures at a Toys"R"Us in Tucson, AZ. Happy hunting! Great news for Canadian fans, Cybertron.CA is reporting the highly anticipated Transformers Prime First Edition figures are starting to appear at retail! 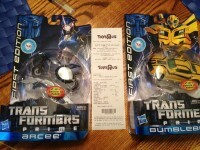 The Entertainment pack featuring Deluxe Class versions of Optimus Prime and Megatron, a DVD, and mini-figures of Jack, Raf, and Miko as well as the Deluxe wave consisting of Arcee, Bumblebee, and Starscream have started to turn up at Toys"R"Us in Ontario. Happy hunting! Good news for Canadian fans, the 25th Anniversary Edition Unicron has been spotted at retail. It looks as though the figure is exclusive to Toys"R"Us rather than Costco. 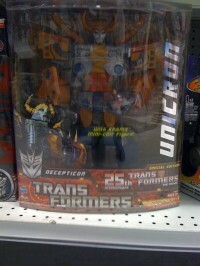 Cybertron.ca member malteselegacy found the Chaos Bringer and his buddy Kranix at an Ontario Toys"R"Us. Happy hunting! 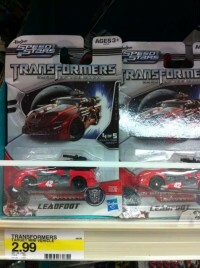 Good news for those of you who just can't enough of Transformers DOTM's Leadfoot, his non-transforming Speed Stars version has been spotted at retail. TFW2005 member ViceGripX found the toy in the Christmas stocking stuffer area of a Tacoma, WA Target. Hopefully the Target exclusive two-pack featuring his Deluxe Class figure isn't too far behind. 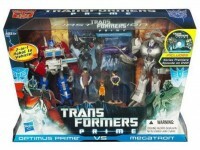 The first wave of Transformers Prime has been released in Hong Kong retails as well as hobby shops. Click any of the above images to view the full gallery.